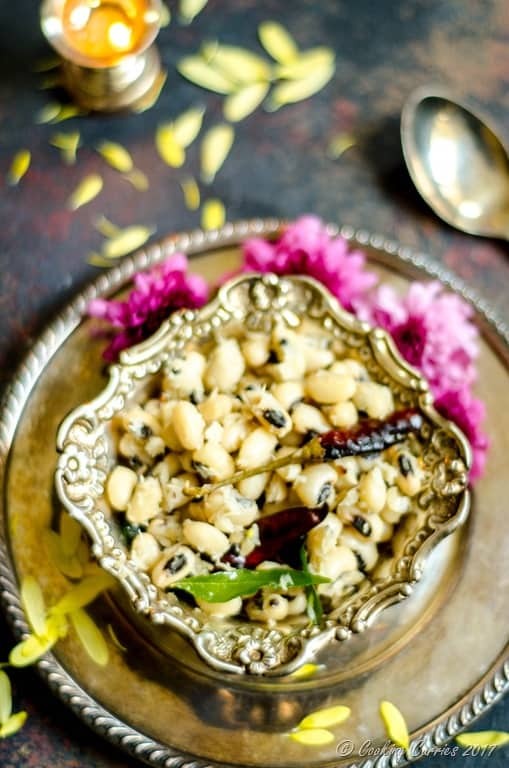 Another easy sundal recipe with black eyed peas as the lentil source. Quick and easy and as always, delicious and protein rich snack! The first part of the festive season is almost coming to an end with Navarathri. The ten days of celebration, festvities, food and fun can be a tad bit exhausting but it is also super fun! 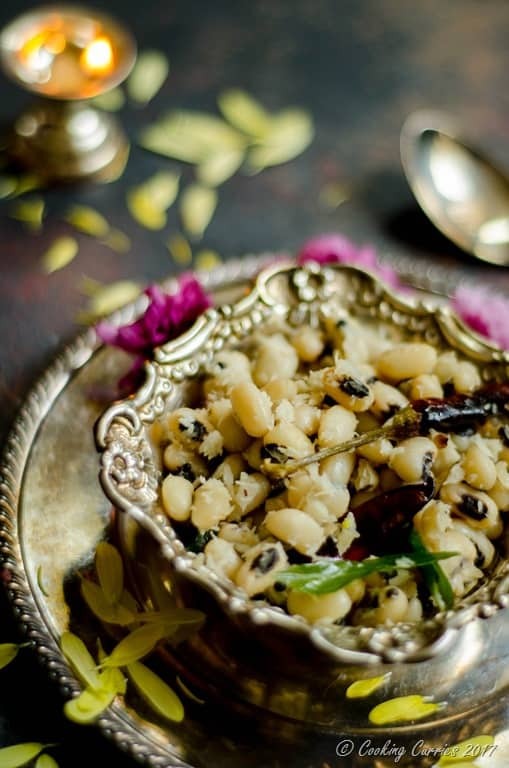 Throughout these 10 days, a savory preparation called Sundal is something that is offered to God as a Neivedyam (offering) and it is made with different kinds of lentils or beans. 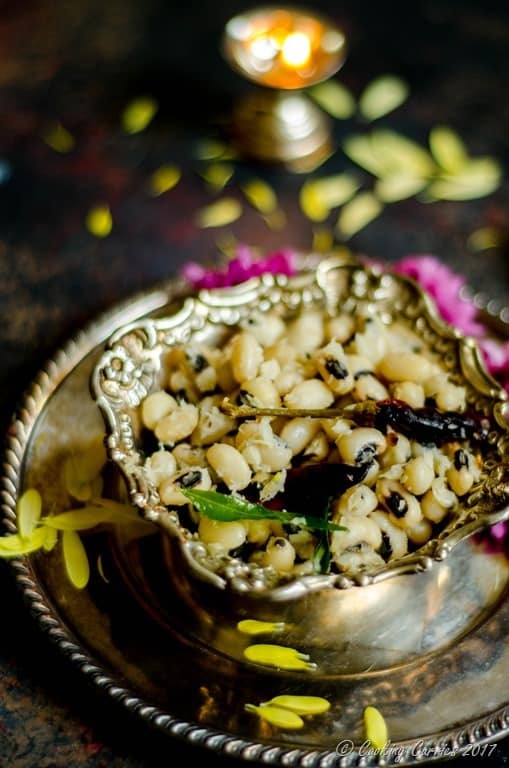 I love that this is the tradition we have, as Sundal is one of the easiest things you can make and making something everyday for 10 days will not be such a daunting task. 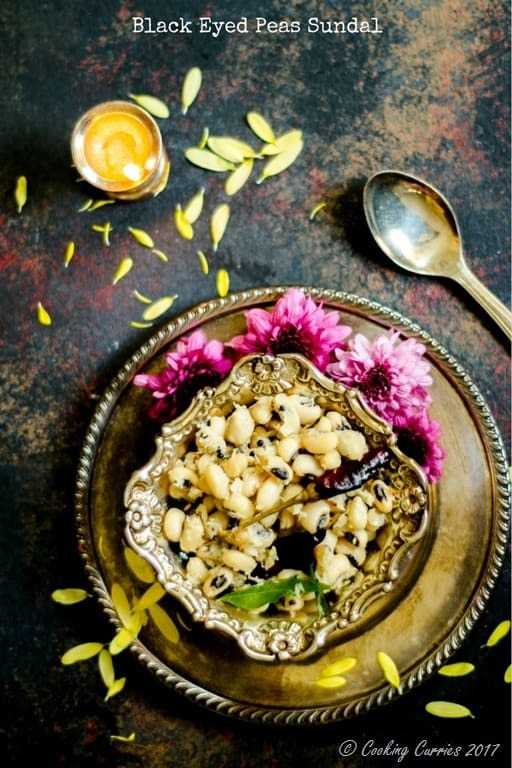 The basic recipe for a sundal is the same, just that the lentil you add as the base is different. That way you dont really have to worry about the recipe everyday you make it and especially by the 10th day when you make it, you can make it in your sleep. Atleast thats what i did. I mean, not literally in my sleep. You know what I mean. Lets head on to the recipe now! Wash and drain the black eyed peas. Heat the oil in a pan and add the mustard seeds to it. Once they splutter, add the curry leaves, asafetida, curry leaves and red chilies. Add the drained black eyed peas, salt and the coconut. Saute for a couple of minutes. Serve hot.